Many of the major Oscar winners in 1938 were repeat winners: Frank Capra (with his third Best Director award), Spencer Tracy (with his second Best Actor award), Bette Davis (with her second Best Actress award), Walter Brennan (with his second Best Supporting Actor award), and Walt Disney (with his seventh Best Short Subject: Cartoon award). 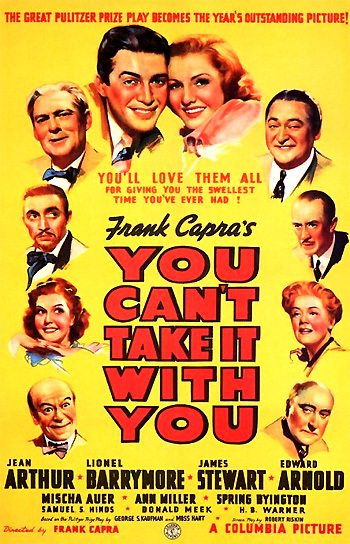 George S. Kaufman's and Moss Hart's Pulitzer Prize-winning and hit Broadway stage play, You Can't Take It With You was adapted to the screen by Robert Riskin. It was a remarkable win to have a comedy take the top prize. The zany film had seven nominations and two wins - for Best Picture and Best Director. Frank Capra's uninspired, but light-hearted and wacky filmed-version of the popular Broadway comedy, with a great cast, told about the eccentric, free-spirited, and madcap Vanderhof family living in a big house in an ethnic Manhattan neighborhood (led by the patriarchal, tax-dodging Grandpa Lionel Barrymore), including a mystery novel writer (Spring Byington), an aspiring ballet dancer (Ann Miller), and other bizarre members. The hilarity increases when the grand-daughter of the house Alice Sycamore (Jean Arthur), who works at a bank with the reluctant vice president and her beau Tony Kirby (James Stewart), invites his ultra-conventional, Wall Street, millionaire tycoon parents - the Kirbys (Edward Arnold plays the powerful, ruthless banker/father and his snobbish wife is performed by Mary Forbes) as dinner houseguests. Only one of the excellent performers in the winning film was nominated for an Oscar - Spring Byington as Best Supporting Actress. 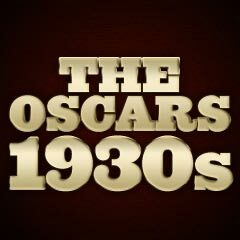 Two young performers were given Special Awards: Mickey Rooney and Deanna Durbin. They were the first recipients of the special juvenile award, distinguished by a miniature statuette. Walt Disney earned his seventh (consecutive) Short Subject: Cartoon award for Ferdinand the Bull. To compensate for the oversight concerning Walt Disney's full-length animated masterpiece the previous year, Snow White And The Seven Dwarfs (1937) was recognized "as a significant screen innovation which has charmed millions and pioneered a great new entertainment field for the motion-picture cartoon." Disney was awarded a regular statuette alongside a row of seven miniature Oscars. Although Michael Curtiz was nominated as Best Director for two films this year, he was inexplicably denied a Best Director nomination for his best film, The Adventures of Robin Hood. And Alfred Hitchcock was not nominated as Best Director for The Lady Vanishes - a film entirely neglected by the Academy. A nomination for Best Director for Jean Renoir for the Best Picture-nominated Grand Illusion was also lacking.